Beda Petersburgiensis est liber anno fere 746 manu scriptus, in Bibliotheca Nationali Russica siglo Lat.Q.v.I.18 servatus. Textum continet Bedae venerabilis Historiae ecclesiasticae gentis Anglorum; etiam Caedmonis "Hymni" Anglosaxonice compositi. Primus omnium codicum in Europa manu scriptorum hic ostendit litteras initiales historiatas, id est, imaginibus minutis illustratas. Arngart, O. S. 1952. 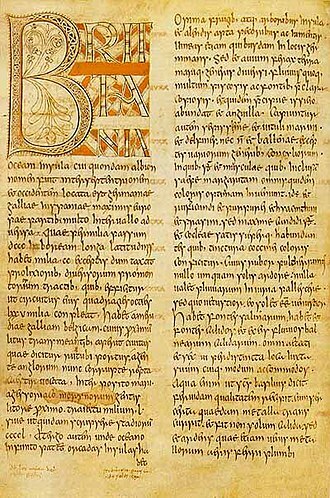 The Leningrad Bede: an eighth century manuscript of the Venerable Bede’s Historia ecclesiastica gentis Anglorum in the Public Library, Leningrad. Early English Manuscripts in Facsimile, 2. Copenhagen: Rosenkilde & Bagger. ————. 1973. "On the dating of early Bede manuscripts". Studia Nordica 45: 47-52. Bévenot, M. S. J. 1962. "Towards dating the Leningrad 'Bede'." Scriptorium 36: 366-9. Colgrave, B. and R. A. B. Mynors 1969, Bede’s ecclesiastical history of the English people. Oxford Medieval Texts. Oxford: Clarendon Press. p. xliv. Dobiache-Rojdestvensky, O. 1928. "Un manuscrit de Bède à Léningrad". Speculum 3: 314-21. Lowe 1934-, Codices latini antiquiores: a palaeographical guide to Latin manuscripts prior to the ninth century. Oxford: Clarendon Press. Art. 1621. Wright, D. H. 1961. "The date of the Leningrad Bede". Revue Bénédictine 71: 265-73. Anderson, O. S. 1941. Old English material in the Leningrad manuscript of Bede’s ecclesiastical history. Skrifter utgivna av Kungl. humanistiska vetenskapssamfundet i Lund/Acta reg. societatis humaniorum litterarum Lundensis, 31. Lund: Gleerup. Dobbie, E. v. K. 1937. The manuscripts of Cædmon’s Hymn and Bede’s Death Song with a critical text of the Epistola Cuthberti de obitu Bedæ. Columbia University Studies in English and Comparative Literature, 128. New York: Columbia University Press. pp. 16–17. Ker 1990. Catalogue of manuscripts containing Anglo-Saxon. Oxford: Clarendon Press. Art. 122. O'Donnell, D. P. 2005. Cædmon’s Hymn, A multimedia study, edition, and witness archive. SEENET A. 7. Cambridge: D.S. Brewer. §§ 4.37-4.38. Robinson, F. C. and E. G. Stanley 1991. Old English verse texts from many sources: a comprehensive collection. Early English Manuscripts in Facsimile, 23. Copenhagen: Rosenkilde & Bagger. [Facsimile of "f. 107r" on pl. 2.3]. Meyer Schapiro, The Decoration of the Leningrad Manuscript of Bede, in Selected Papers, volume 3, Late Antique, Early Christian and Mediaeval Art, 1980, Chatto & Windus, London, ISBN 0701125144 (originally Scriptorium, xii, 2, (1958), also JSTOR etc.). T. Voronova and A Sterligov, Western European Illuminated Manuscripts (in the St Petersberg Public Library), 2003, p198, Sirocco, London. Ker. 1958a. "A key to Bede’s scriptorium: Some observations on the Leningrad Bede". Scriptorium 12: 182-90. Ker. 1958b. "An autograph of the Venerable Bede?" Revue Bénédictine 68: 200-2. Meyvaert, P. 1961. "The Bede 'signature' in the Leningrad colophon". Revue Bénédictine 71: 274-86. ────. 2002. "The accuracy of the Saint Petersburg Bede." Notes and Queries 247: 4-6. Parkes, M. B. 1982. The scriptorium of Wearmouth-Jarrow. Jarrow Lectures. Jarrow: [St. Paul’s Rectory]. 5-12. Vicimedia Communia plura habent quae ad Bedam Petersburgiensem spectant. Novissima mutatio die 11 Martii 2013 hora 21:22 facta.